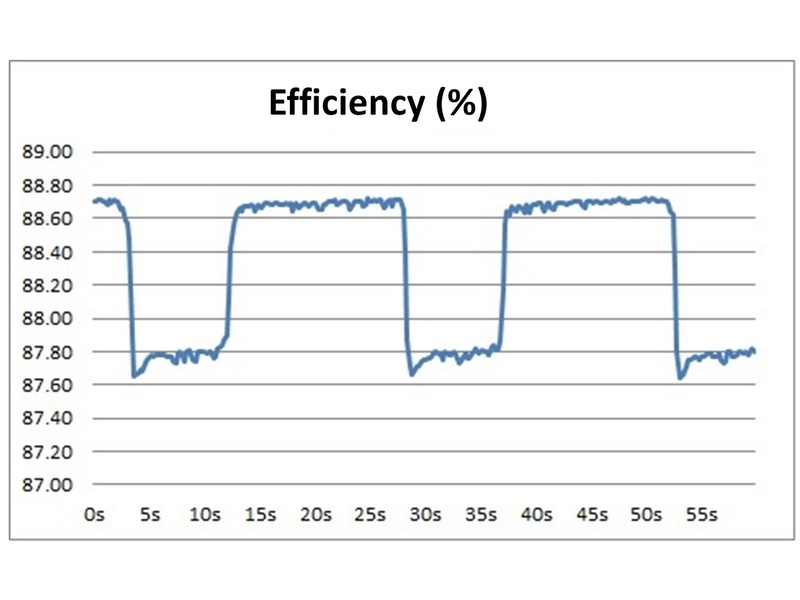 While measuring the efficiency of a small 12 Vdc to 115 Vac power inverter the readings fluctuated between 87.80 % and 88.70 % with a consistent load. 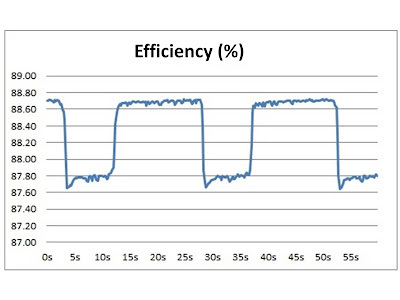 To learn more about the efficiency, an IntegraVision Power Analyzer with its new data logging feature was used to capture efficiency over time. The new data logger feature captures every numerical measurement from each channel over a period of time. With just two parameters to configure, the data logger is easy to use. The length of data logging can be as short as 1 second or as long as 365 days. The interval for recording data can be set as low as 50 ms to as high as 24 hours. If an interval of 200 ms or longer is selected, THD and efficiency measurements are also saved. All measurements are gapless, continuous whole cycle measurements. Below is a graph of efficiency. As you can see the efficiency changes over time. Efficiency is calculated from the output power divided by the input power. The data logger file contains the output and input power. Both are graphed below. We can see the efficiency is fluctuating due to the input power. The inverter contains a small fan that turns on about every 10 seconds and increases the amount of power required. If you are interested in seeing a video of the inverter being tested, watch this YouTube video. A couple of final notes on using the data logger: the data logger file is a csv file; the rows are time stamped and hold the measurements for each interval. Each column is for a different measurement and a single channel can have over 30 measurements. The columns are labeled for each type of measurement and by channel. Check out the video mentioned above to see the data logger file and all of this in action. Yet another new Keysight power product family - this time, compact bench-top DC power! Last week, I posted about our new photovoltaic (PV) array simulators, models N8937APV and N8957APV. These power supplies can produce an I-V curve as their output characteristic and provide up to 15 kW, 1500 V, and 30 A. 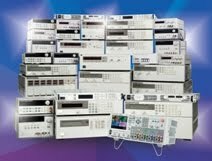 Today, I am posting about yet another new series of Keysight power products (wow, our R&D team has been busy!). This new family is at the opposite end of the power spectrum compared to the 15 kW PV array simulators. The new family consists of five models in the 30 to 40 W range with voltages up to 100 V and currents up to 5 A all providing a standard rectangular output characteristic. Click here for the press release that just went out yesterday! I really like this new family of power supplies and I think you will too! You can choose from a variety of voltage and current combinations to meet your needs. You can save space on your bench with these very compact models that are only 2U high and ¼-rack-width wide. 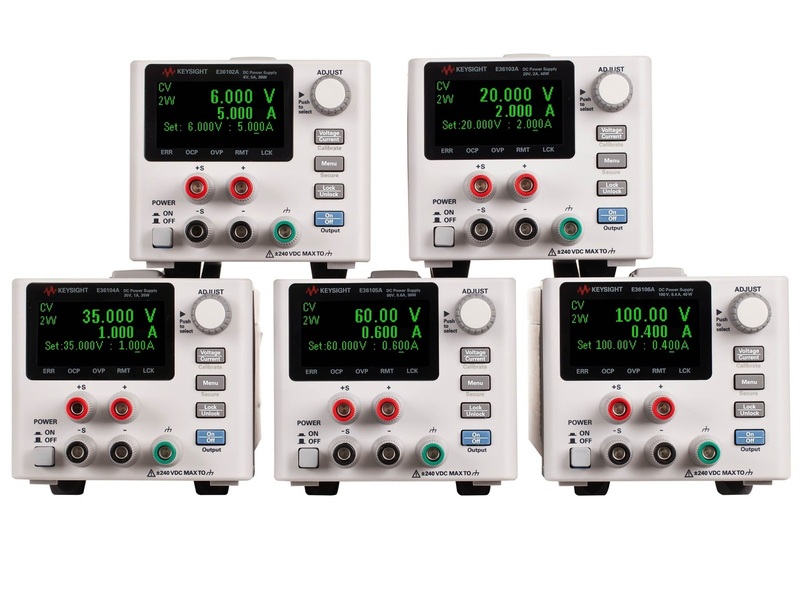 You can set and read back very accurate voltage and current values with a basic accuracy of 0.05%. You can view the high visibility OLED display from nearly any angle. You can regulate your set voltage at your load to make up for voltage drop in your load leads with remote sense terminals and leads. You can communicate with these power supplies with either LAN or USB since both interfaces are included. You can protect your device under test with the built in overvoltage protection and overcurrent protection. And you can easily access all of the other beneficial features in this tiny package with the on-screen menu system. So you can see that there is a lot you can do with these compact power packages! Below is a picture of the family showing each of the five new models. So the next time you have to equip your bench with DC power that goes beyond a basic power supply, consider the new E36100 Series Programmable DC Power Supplies from Keysight Technologies. I know I would (but then again…..look where I work…..)! What is meant by a “fast” power supply? 1. 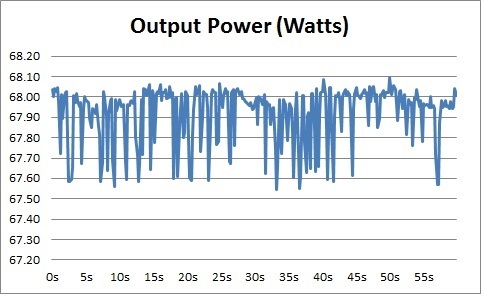 How long does it take for a power supply output voltage to change from one value to another value? 2. 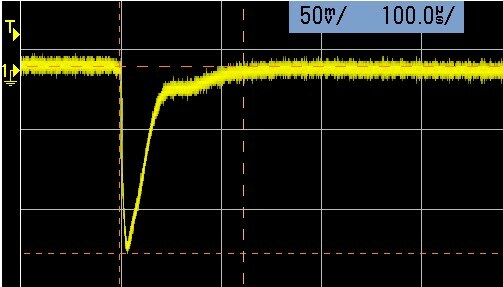 How long does it take for a power supply output voltage to recover to its original value following a load current change? This customer wanted to know the answer to question 1. Luckily, both of these answers can be found in our specifications and supplemental characteristic tables. Question 1 is referring to a supplemental characteristic that has a variety of similar names: programming speed, settling time, output response time, output response characteristic, and programming response time. This is typically described with rise time and fall time values, or settling time values, or occasionally with a time constant. Rise (and fall) time values are what you would expect: the time it takes for the output voltage to go from 10% of its final value to 90% of its final value. 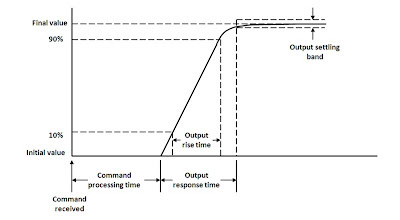 Settling time (labeled “Output response time” in the graph below) is the time from when the output voltage begins to change until it settles within a specified settling band around the final value, such as 1% or even 0.1%, or sometimes within an LSB (least significant bit) of the final value. My fellow blogger, Ed, posted about how this affects throughput (click here) back in September of 2013. Question 2 is referring to a specification called transient response, or load transient recovery time. Whenever the load current changes from a low current to a higher current, the output voltage temporarily dips down slightly and then quickly recovers back to the original value (or close to it). 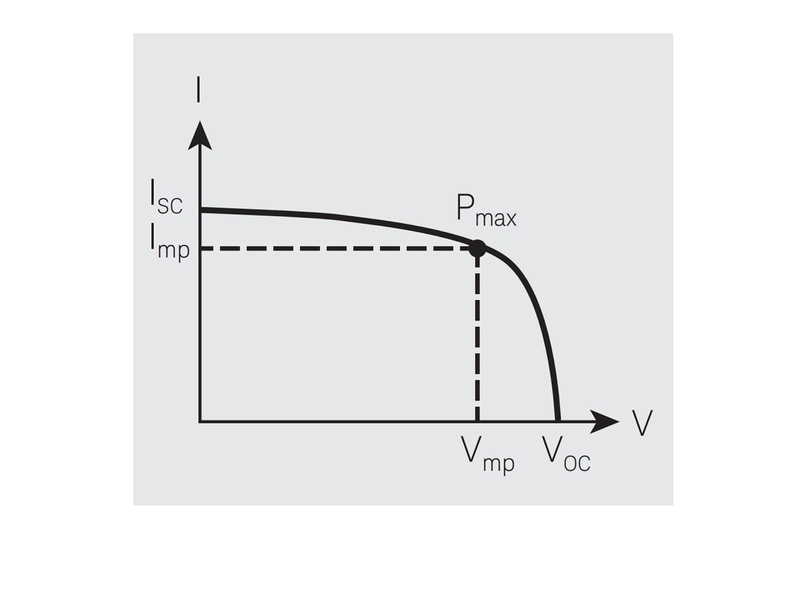 The feedback loop design inside the power supply determines how quickly the voltage recovers from this load current change. Higher bandwidth designs recover more quickly but are less stable. Likewise, lower bandwidth designs recover more slowly and are more stable. Ed posted about optimizing the output response back in April of this year (click here). 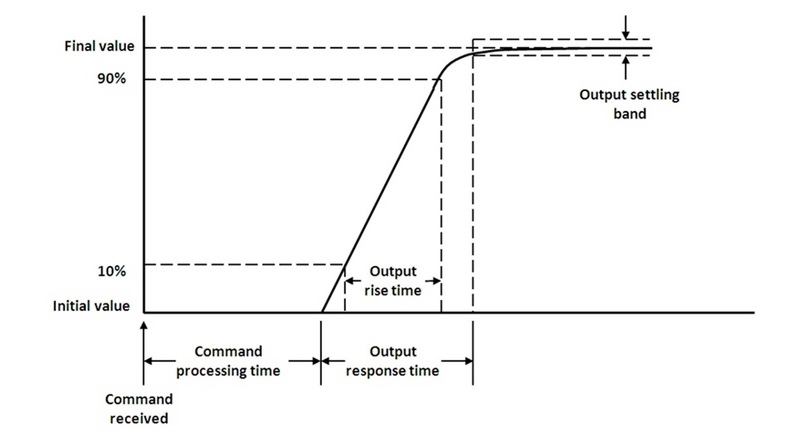 So the transient response recovery time is the time from when the load current begins to increase (coincident with the output voltage beginning to drop) to when the output voltage settles within a specified settling band around the final voltage value. Our customer was interested in a “fast” power supply, meaning one with a settling time to meet his needs. Once we understood what he needed, we directed him to a power supply that could easily meet his requirements! I am not sure how many of you know but we have instrument specific forums at Keysight. You can find the power supply forums at: Keysight Power Supply Forums. If you have questions on power supplies you can post them there and either someone here will answer them or sometimes another user has had a similar experience. 1. What programming languages/IO Libraries do you use? We are thinking of concentrating on VB.NET, C#, C/C++, Labview, Matlab, Excel (VBA), and Python. Are we missing anything? 2. Any specific programming examples that would help you more effectively program your power supplies. I cannot guarantee that we will do them but anything requested will be considered. You can either answer these questions in the comments here or you could use the forums to respond to the thread that I just created for this blog post: Power Supply Programming Example Feedback Thread. While I normally avoid simply promoting new products in my blog posts, when Keysight Technologies announces a new power product, I feel obligated to mention it here. After all, this is Keysight’s power blog! So, yesterday, Keysight Technologies announced two new photovoltaic array simulators. Click here for the press release. The two new models are the N8937APV (208 Vac 3-phase input) and N8957APV (400 Vac 3-phase input). Both are autorangers and provide up to 15 kW, 1500 V, and 30 A on their outputs. Autoranging power supplies cover more output voltage and current combinations than power supplies with rectangular output characteristics. Click here for a previous post on autorangers and here for a post on the power supplies on which these two new models are based. These models can be put in parallel to provide a single output of up to 90 kW! They complement the family of Solar Array Simulators (SAS) that have been available from Keysight for decades. So what is a photovoltaic array simulator? It is a specialized power supply that has an output characteristic that mimics the output characteristic of a solar panel (or a collection of solar panels known as a solar array). Photovoltaic (PV) simply refers to something that generates electricity when exposed to light so solar panels are PV devices. Solar panels have an output characteristic called an I-V curve that looks something like the solid line shown below. Isc is the short circuit current, Voc is the open circuit voltage, and Imp and Vmp are the current and voltage at the maximum power point. Solar arrays are made by taking many solar panels and connecting them in series and parallel combinations for more power. When put in series, the total voltage increases. When put in parallel, the total current increases. Solar inverters take the DC output power from a solar array and convert it from DC into AC that can be used to power AC-mains devices (like those that plug in the wall in your home). So manufacturers of solar inverters are interested in testing their inverters and using a PV array simulator helps them. 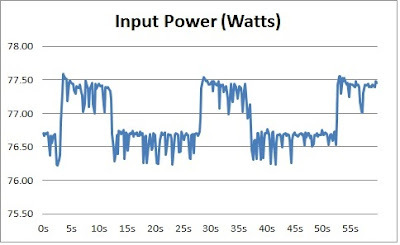 Instead of connecting their inverters to a real solar panel array that operates only when there is sunlight shining on it, they “simulate” the power output of the array with a PV array simulator. This enables them to test the inverter in many different conditions that affect the I-V curve of a solar panel, such as the temperature surrounding the panel, the angle of the sun on the panel, and cloud cover. Inverters must work when solar panels are subjected to all variations of these parameters, and waiting for them to occur with an actual solar array and the sun is not practical. The inverter manufacturers are very interested in harvesting as much power as possible from the array, so they design their inverter circuitry to include Maximum Power Point Tracking (MPPT) algorithms that ensure their inverters operate at Pmax (the maximum power point) shown on the I-V curve above. The new Keysight photovoltaic array simulators allow engineers to test their MPPT algorithms. So the next time you see a rooftop of solar panels, or a parking lot covered with them, or a field filled with panels collecting sunlight and converting it into electrical energy, think about the inverter connected to those panels converting the DC into AC for your use….hopefully, the inverter was fully tested with a Keysight SAS or one of these new photovoltaic array simulators! Not all two-quadrant power supplies are the same when operating near or at zero volts! 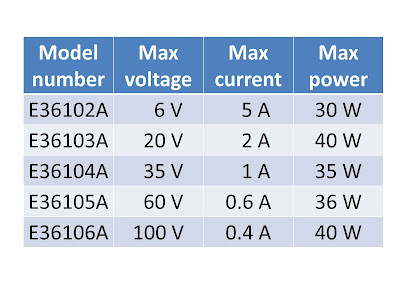 Occasionally when working with customers on power supply applications that require sourcing and sinking current which can be addressed with the proper choice of a two-quadrant power supply, I am told “we need a four-quadrant power supply to do this!” I ask why and it is explained to me that they want to sink current down near or at zero volts and it requires 4-quadrant operation to work. The reasoning why is the case is illustrated in Figure 1. 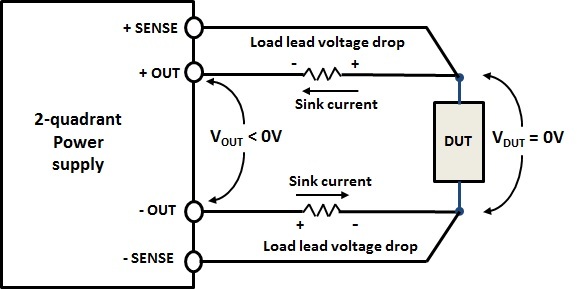 As can be seen in the diagram, in practical applications when regulating a voltage at the DUT when sinking current, the voltage at the power supply’s output terminals will be lower than the voltage at the DUT, due to voltage drops in the wiring and connections. Often this means the power supply’s output voltage at its terminals will be negative in order to regulate the voltage at the DUT near or at zero volts. Hence a four-quadrant power supply is required, right? Well, not necessarily. It all depends on the choice of the two-quadrant power supply as they’re not all the same! Some two-quadrant power supplies will regulate right down to zero volts even when sinking current, while others will not. This can be ascertained from reviewing their output characteristics. 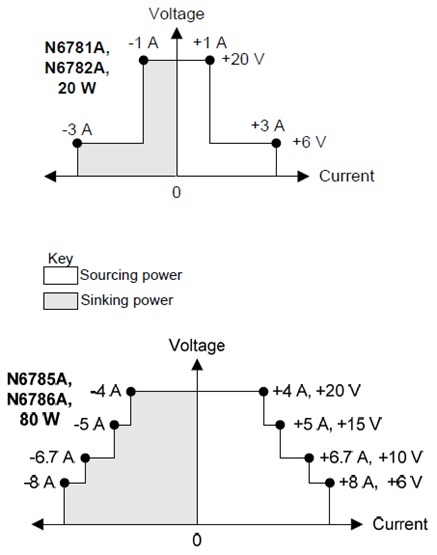 Our N6781A, N6782A, N6785A and N6786A are examples of some of our two-quadrant power supplies that will regulate down to zero volts even when sinking current. This is reflected in the graph of their output characteristics, shown in Figure 2. 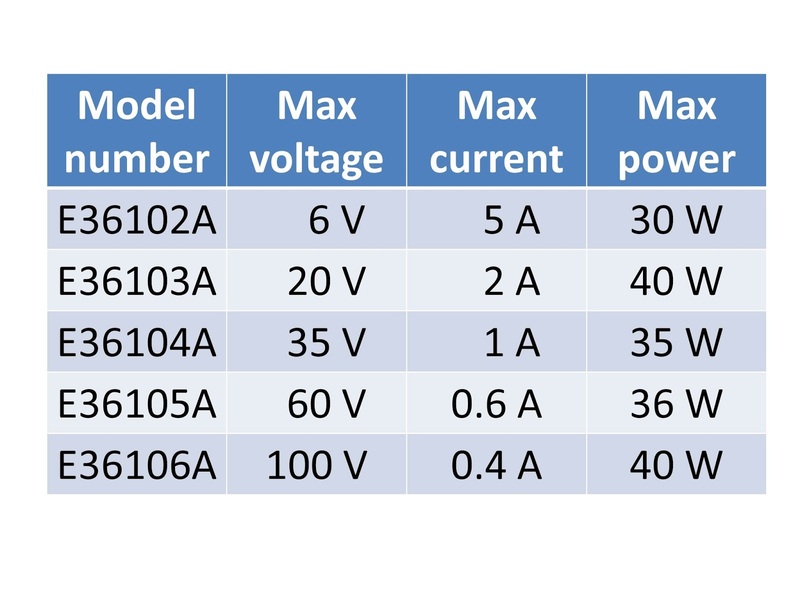 What can be seen in Figure 2 is that these two-quadrant power supplies can source and sink their full output current rating, even along the horizontal zero volt axis of their V-I output characteristic plots. The reason why they are able to do this is because internally they do incorporate a negative voltage power rail that allows them to regulate at zero volts even when sinking current. While you cannot program a negative output voltage on them, making them two-quadrants instead of four, they are actually able to drive their output terminals negative by a small amount, if necessary. This will allow them to compensate for remote sense voltage drop in the wiring, in order to maintain zero volts at the DUT while sinking current. This also makes for a more complicated and more expensive design. 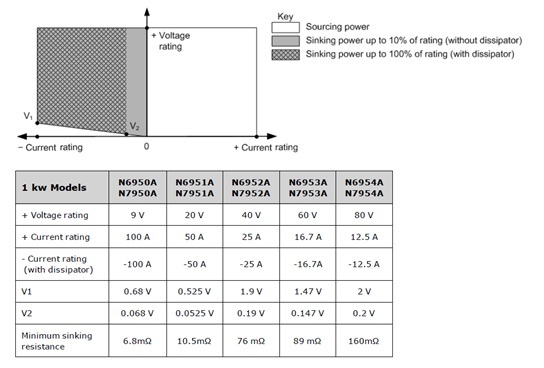 Our N6900A and N7900A series advanced power sources (APS) also have two-quadrant outputs. Their output characteristic is shown in Figure 3. 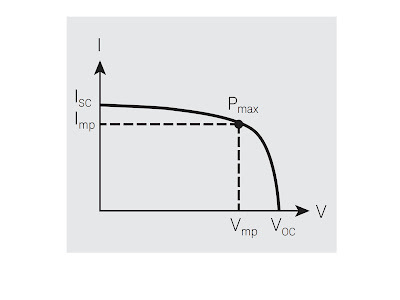 Here, in comparison, a certain amount of minimum positive voltage is required when sinking current. It can be seen this minimum positive voltage is proportional to the amount of sink current as indicated by the sloping line that starts a small maximum voltage when at maximum sink current and tapers to zero volts at zero sink current. Basically these series of 2-quadrant power supplies are not able to regulate down to zero volts when sinking current. The reason why is because they do not have an internal negative power voltage rail that is needed for regulating at zero volts when sinking current. So when needing to source and sink current and power near or at zero volts do not immediately assume a 4-quadrant power supply is required. Depending on the design of a 2-quadrant power supply, it may meet the requirements, as not all 2-quadrant power supplies are the same! One way to tell is to look at its output characteristics. How do I use Python (and no installed IO Library) to talk to my instrument? Our newest support engineer and I have decided to learn Python (https://www.python.org/) so that we can generate programming examples. We are hearing that more and more customers are using Python so we figured that we would get on the front side and learn some Python. This blog represents my first attempts at doing anything in Python so there are probably better methods to do this but I wanted to get this out since I am pretty excited about it. Note the text “Welcome to …”, this will be important later. Note that the query response ends with a new line. This will be important later. The prompt also re-appears after every interaction. In the case of the APS, the prompt is the model number ("N7953A>"). On some other instruments , the prompt is "SCPI>". Either way, you need to know what the prompt is so that you can account for it later. As you can see we get the same response as before. Now we are set to send the next command. So that's an extremely basic example of how to use Python and Telnet. I used the shell because that is what I used to figure this all out. You can also write scripts. As Chris and I learn more about Python, we will be releasing more examples. Stay tuned for those.